Notes: Biennial report of the Dairy and Food Commissioner of WI: Vermont 1896, Black Earth PO 1901-1930. 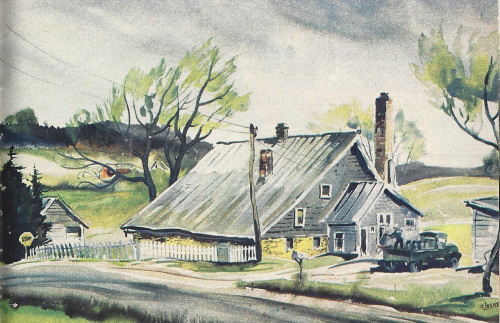 From"The Town of Vermont - 'The Early Years'", Marian Swoboda: "located on the corner of Old Indian Trail (now Blue Mounds Trail) and County Highway JJ was incorporated in 1888. It is told that many interesting things happened at this factory. Years ago there was a rule that all farmers had to have their milk delivered by 9:00 a.m. When Adam Hefty was the cheesemaker he would blow their telephone ring with the whistle on the boiler when it was getting close to that time. The idea of Patron’s Mercantile Co-op originated at the factory. At the time Amos Thorsrud was ordering supplies for the factory and the farmers, someone suggested, "Why not have our own store in Black Earth?" So, Patron’s was born. When Torge Goderstad was at Vermont making cheese, Charles Bennett suggested to Torge he should get a truck and haul milk for the farmers. Hjalmar Sveum was the first milk truck driver hired. The factory closed in 1967 when the boiler broke down. The building is no longer standing."